The best TVs of the 21st century | What Hi-Fi? Given the importance and popularity of TVs in today's tech landscape, you'd be forgiven for thinking we've been testing them since the magazine began back in 1976. But our first tests of CRT TVs didn't start until the 80s. And it wasn't until 2001 that we handed out our first TV Award... to a 28-inch Philips set. Over the years we've seen screen sizes increase, prices fluctuate, and designs get sleeker and smarter. Screen technologies have improved as well, with 480p and 576p resolutions giving way to Full HD and Ultra HD 4K, and plasma technology falling by the wayside in favour of LCD and OLED displays. As with all What Hi-Fi? reviews, these TVs were judged on a strict performance-per-pound basis. There may have been better-performing sets that year, but the Product of the Year winners shown here represented the best TV performance for the given price. We handed out our very first TV Product of the Year Award to this 28in Philips in 2001. We praised its "plug and play" ease of use and excellent picture. What was surprising was our apparent satisfaction with the TV's speakers. Although, the CRT design certainly allowed for more breathing room than today's wafer-thin screens. There were two TV categories in 2002, one for widescreen TVs (how futuristic) and one for plasma TVs. The widescreen winner was this Toshiba, which wowed us with its 100Hz scanning and progressive-scan mode for NTSC video signals, which "greatly enhances the picture quality from imported DVDs". The range of connections on offer was also impressive at the time, most notably the inclusion of a component video input. And, naturally, we enjoyed the picture. The other 2002 winner will certainly pique interest. Pioneer was one of the big names in plasma technology at the time, but this was its first plasma range to be "true TVs rather than just displays". Previously, most Pioneer plasmas had lacked TV tuners and were aimed at the high-end market. This 43in model was praised for its intuitive user interface and features, but it was really all about the performance, which offered "fine black definition and detail". But that quality came at a hefty price - nearly six grand for a 43in TV. We said in the review, "...with interest-free credit deals and cheap loans aplenty on offer, you could be enjoying a fantastic flatscreen sooner than you think. Go on..."
In hindsight, a cheap loan for a new TV may not be the best financial advice we've given. This 36in Panasonic was the flagship TV of the 2003 range. We described it as having "monstrous proportions" - it weighed 81kg, ten times heavier than the average 40in TV now. It featured more pixels per line than most TVs back then, "giving it near computer monitor resolution". Apparently, that was a good thing. "When it comes to the picture, prepare to enter a new dimension", we said, praising its fantastic contrast levels and deep blacks. 2003 also saw two TV Award-winners, and the one for best plasma screen went to this 32in Sony. It was one of the first plasma screens to "dispel our lingering doubts about plasma's performance potential" - yes, plasma wasn't always held in such high regard. This Sony was able to serve impressive levels of detail, something that had previously been "one of plasma's primary failings", we noted. It was also quite a looker for its time, with Sony even managing to integrate the TV tuner into the chassis - something still relatively rare at a time of separate TV boxes. 2004 marked the first time the two TV categories were integrated, and it was Panasonic that took the sole Award. This time it was the turn of its 42in plasma screen, giving us an early indication of how the brand would dominate this category in the years to come. Its arsenal of picture-enhancing technologies was certainly effective, and its DVD playback performance cemented its place in What Hi-Fi? history. It seems absurd that Finding Nemo was released way back in 2004, but the colours the Panasonic displayed when we used it as a test disc were exemplary. The screen resolution? 852 x 480. The televisions category was brought to the front of the Awards pages in 2005, a sign of TV's increasing importance in the AV world. "How long ago is it that £2000 would only buy you a decidedly ho-hum flatscreen TV, probably from an obscure brand that you'd never heard of?" A strong opening gambit for this Sony Award-winner, which was considered a real bargain in terms of inch-per-pound. Sony's win marked the first time that a big-screen LCD TV (yes, 40in was considered big at the time) could compete with plasma technology. It featured built-in analogue and digital TV tuners as well as a 1920 x 1080 Full HD resolution. The picture served up from those tuners was impressive, but again we highlighted the excellent performance with DVDs. The Pioneer Kuro. It's one of the most enduring names in TV history, offering better black levels than any other screen at the time. What's more, 2007's Awards marked the first mention of Blu-ray discs - which meant the picture quality was jaw-dropping. The Full HD revolution was under way, even if this Pioneer Kuro somewhat controversially settled for HD-ready rather than Full HD resolution. Sony was on top form again in 2008, stealing the Product of the Year crown back from Pioneer. Although Pioneer’s 50in Kuro LX5090 did win an Award, this Sony proved to be the ultimate champion. The screen excelled with HD pictures, with blacks inky deep and whites super bright. Upscaling abilities were impressive too, as was its standard-def performance. It was also noteworthy for boasting "a motion processing mode that most of the review team actually likes". "Sony has reinvented the LCD TV", we boldly declared. Philips showed once again it could party with the big boys. This 42in LCD set had a relatively sleek design and thin bezel, and included features such as five HDMI inputs, wi-fi (finally!) and Ambilight technology (which we still love). Coupled with a highly detailed HD picture, choosing the overall winner in 2009 was easy. The Philips TV even managed to impress us in the sound department. Although we recommended adding a speaker package (Monitor Audio’s RX6 AV12) for a proper home cinema set-up, the built-in speakers provided a more than adequate listen. The 40EX503 marked a triumphant return for Sony after failing to win a single Award in 2009, in part due to backlighting issues. This £660 TV delivered a natural colour palette, but had the ability to be vibrant and punchy when needed. The 100Hz Motionflow processing technology provided solid, smooth images, both from Blu-ray discs and the built-in Freeview HD tuner. This Panasonic saw the brief rise of plasma to the top of the charts - for a much more wallet-friendly price. Panasonic fitted the 42GT30 with two high-def tuners in the form of Freesat and Freeview HD, and both provided deep, detailed blacks and barely any picture noise. The 2D and 3D performances from a Blu-ray disc were also well received, and the sound quality was weighty and substantial. Sony’s HX series of TVs were top performers, but none more so than this 40in HX853. Clarity and detail were among its biggest strengths, and the speaker system housed within the plinth was impressive, too. 3D pictures provided a fully immersive experience and the smart functions worked well - you could stream HD content over wi-fi - making this a fantastic all-rounder. Panasonic was determined to win its crown back in 2013, and it did so with another extraordinary plasma screen. The list of features was endless, with almost every possible need catered for. But ultimately it was the picture quality, which was nothing short of stunning, stole the show. Panasonic stopped production of its plasma screens at the end of 2013, making the GT60 series its swan song. With plasma screens no more, Full HD and 4K would become the battleground for TV supremacy. Samsung was the big winner of the 2014 Awards with its first 4K TVs, but this 48in Full HD set offered one of the best performance-per-pound ratios we’ve seen. Featuring all the major catch-up TV services, it delivered a stellar picture performance no matter the source, serving up a balanced, clean and stable picture with excellent contrast levels. Picture noise on standard-def images was handled well, and motion didn’t take a hit either. 4K TVs may have been grabbing the headlines, but Samsung proved that there’s still plenty of life left in Full HD screens. Samsung continued its gong-winning ways with this 48in Full HD TV. This curved screen delivered a fantastic picture quality for the money, with natural colours and lashings of detail on display. Samsung's 4K TVs dominated the rest of the Award categories this year (along with a first OLED win for LG), but the price was still too high a barrier for the coveted Product of the Year crown. And sure enough, 2016's Awards saw a 4K TV winning the Product of the Year title. The price may be double that of its former Full HD sibling, but this 49in Samsung delivered a "stunning all-round performance". That included a vibrant and subtle picture that took advantage of the new HDR tech, and offering plenty of features including Netflix and Amazon's 4K streaming services. 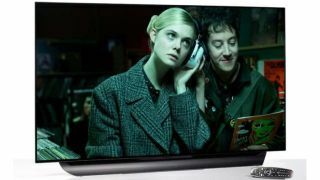 Samsung's LCD and LG's OLED screens took turns winning at the higher price ranges, but it was now clear that Ultra HD 4K resolution was in full reach of the mainstream. The year OLED came of age? This wasn't the first What Hi-Fi? Award for an OLED but it was the first time an OLED TV had won Product of the Year. The 2017 TV market was all about OLED vs QLED and LG, synonymous with OLED for so long, took the spoils. This wasn't the flagship OLED in LG's range nor was it the cheapest model. Instead it found the sweetspot, matching price and performance for a superb value picture. Elsewhere there were Awards for Samsung QLEDs and a Sony OLED but it was the B Series LG that took home the top prize. Another LG, another OLED, with this 55in model finally coming closer to affordable realms. 2018 saw 4K OLED TVs get incrementally better than before, with this superb all-rounder from LG offering brighter, punchier and sharper pictures than last year's sets. Its wonderfully natural images and gorgeous deep blacks rival that of Sony's class-leading A1 sets, too. A stylish, talented set, with stunning picture quality and a more wallet-friendly price tag - this LG OLED55C8PLA is a fantastic telly.